Warning! This David Bailey book could break your back! New Taschen Sumo edition of work by iconic British photographer David Bailey is so heavy it comes with its own tripod! Taschen is launching a monster 440-page retrospective of the work of British photographer David Bailey. Measuring 50 x 70cm, this "Sumo" edition weighs a back-breaking 30kg – and it is so heavy that it comes with its own custom-designed three-legged table so that buyers can actually turn the pages without hurting themselves. Now aged 81, Bailey became one of the most famous fashion and portrait photographers when still in his twenties during the swinging sixties. He is still a highly-sought after and active photographer, running his studio in central London – not far from where he was born. Bailey's book, which is simply called David Bailey, is a who's who of the rich and famous over the six decades of his career. 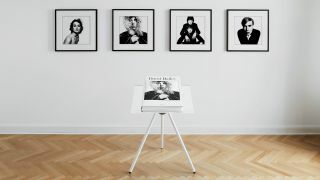 The 300-plus black and white portraits, mainly shot against his signature white background, include iconic portraits of Mick Jagger, the Kray twins, The Beatles, Andy Warhol, Margaret Thatcher, Jack Nicholson and Her Majesty the Queen. The book comes supplied with four different dust covers, with the book itself featuring a shot of Bailey himself. The signed limited-edition book will cost £2,250 / $3,000 when it goes on sale in April. Each of the 3,000 books is numbered – with the first 300 selling with signed prints at an even higher asking price. The first 75 of these, which comes with a portrait of Lennon and McCartney, cost £11,250 / $15,000 and have already sold out. The book can be ordered direct from Taschen. Three other photographers have previously had Sumo editions published by Taschen: Sebastiao Salgado, Annie Liebowitz, and Helmut Newton.